The news today is chock full of stories about sensitive information being carried out the institutional perimeter on ‘simple’ USB devices. These powerful portable drives rightfully worry IT as a means for devastating data loss at the hands of malicious insiders. But it’s pretty easy for organizations to get so wrapped up about what goes out on USB drives that they forget to protect against what comes in their environments via USB. 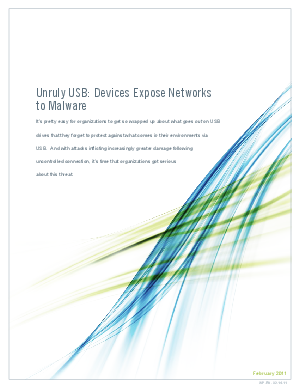 After all, according to researchers, as many as one in four malware attacks is carried out through a USB device. In the past year, we’ve seen Stuxnet raise its ugly head and Conficker continue to circulate through the USB vector. And with attacks inflicting increasingly greater damage following uncontrolled connection, it’s time that organizations got serious about this threat.